The Rev. Jonathan Weaver thought paying off his church’s 30-year mortgage in seven years was fairly impressive. But to the banks in Prince George’s County, Md., home to a large and influential African American community just outside Washington, D.C., it was not impressive enough. Despite his church’s excellent credit record, Weaver said when he returned to the same institution to get a second loan for a newer, bigger building, he did not get the welcome he was hoping for. Instead, he received a litany of excuses and hoops to jump through in order to get a loan he felt his congregation had earned. It was only after he wrote a letter to the bank promising to steer his 750 congregants toward other banks that his church got the loan. 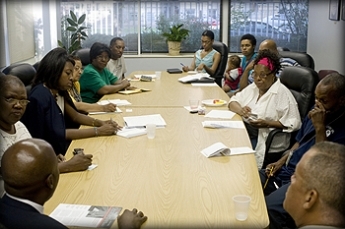 The church leaders banded together and formed the Collective Banking Group, an organization advocating for economic empowerment in their community. The original group of pastors approached banks in the area about setting up mutually beneficial covenant agreements. The Collective Banking Group, known as CBG, currently has agreements with five banks in the area. The member churches have accounts at those banks and refer their congregants who get better rates or loans and mortgages, while the banks gain more business from the community. And a profitable one, for both sides. Combined, the member churches and their congregations have deposited about $400 million into the CBG covenant banks since 1993, Weaver said. In turn, CBG members have received loans, mortgages, access to credit, and other services worth close to $350 million, Weaver said. Another four CBG chapters have started across the country. They’re located in Miami, Fla., Baltimore, Md., Charlotte, N.C., and Austin, Tex. The charter branch in Prince Georges County, Md., now has 150 churches representing more than 200,000 members. Though Chicago does not have a branch of CBG, other efforts have started in the area to fight for the economic empowerment in African American communities. At Living Word Christian Center in west suburban Forest Park, Pastor Bill Winston is the driving force behind a campaign to acquire a bank. Through its holding company, Covenant Bancshares, the church seeks to give its members more of a financial advantage. “We wanted to be able to reach out to the community that the pastor is closely connected to, and to economically empower that community,” said John Sorensen, the president of Covenant Bancshares. Plans to acquire an existing bank have been underway for about five years, Sorensen said. The company currently has about $5 million in escrow and is in the process of fundraising. Covenant is also looking to empower the community through education and financial literacy, Sorensen said. To that end, Living Word helps sponsor The Joseph Business School, a school aimed at using biblical principles to train leaders in entrepreneurship and business management. “We want to bring people to the next level, to make them feel like they are more in control of the circumstances in their lives,” Sorensen said. O.S. Owen, director of financial and community education for the Center for Economic Progress, said educating the community financially was the best way to bring about economic equality. The Center for Economic Progress provides free tax services for low- to moderate-income families and individuals. “It’s an issue in minority communities that there is a lack of access to knowledge about the financial world,” said Owen, adding that many black families have irregular incomes and don’t maintain bank accounts because of high fees. The Chicago Urban League is working to improve financial education and awareness by supporting black entrepreneurs and encouraging others to follow them. Since Jackson took the helm at the Chicago Urban League last year, she has made it the organization’s mission to work on the economic development of the city’s African American communities. To further these goals, in June, the organization opened an entrepreneurship center at Northwestern University’s Kellogg School of Management. The center, which was a partnership between Kellogg, the Chicago Urban League and BP America, will feature programs like business development assistance, strategic consulting services, and an intensive six-month program for dedicated entrepreneurs. Jackson said financial education was one of the primary reasons for opening the center because a Chicago Urban League study of 1997 and 2002 census data, which showed that Cook County had more black-owned businesses than any other county in the U.S. But the same study also shows that just 4,000 of Cook County’s 64,000 black-owned businesses had one or more employees. Additionally, the average annual revenue for Chicago’s African American-owned firms with paid employees was $927,500, five times less than the average for their white-owned counterparts. The Chicago Urban League will devote itself exclusively to pursuing economic justice and development instead of restricting itself to social services, Jackson said during a speech at the organization’s annual luncheon in February. “The African American community is facing permanent economic isolation and –¦ we can no longer afford to just manage the problem. We must manage ourselves out of the problem,” Jackson said during the speech. Like the pastors did in Prince Georges County, Md., improving the notoriously fragile relationships between African Americans and financial institutions could help. “It’s been a historic problem,” said Jonathan Swain, executive director of the Beloved Community, an organization affiliated with Saint Sabina, an African American Catholic church in the Auburn-Gresham neighborhood on the South Side. Swain believes that building relationships between faith-based organizations and financial institutions will help black communities realize their economic goals. “It would allow for a collective voice when the [banks] wouldn’t listen to those voices individually. We would get a better response and a fairer response,” he said.